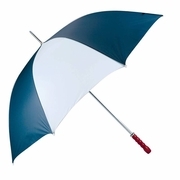 Golf umbrella with white and navy alternating panels, metal shaft and wooden handle. Large enough for 2 people to share during rain showers. Measures 41" from tip to end of handle and 60" across the top.